What Songs are Your Favorites? You may not know me well, but you can tell a lot about a person from the music they enjoy. I just published the Heart Dancing Playlist – 23 of my favorite songs of all time! Guaranteed to get you moving around the room and your heart dancing. Just go to the Heart Dancing Facebook group and ask to join. The post that contains the link to the song list is at the top of the page. Help me get this party started! If I missed your all time favorite song – let me know in the comments below. Music is the language of the soul – I’ve shown you mine…now it’s your turn! With the arrival of Spring, the Heart Dancing Radio Show has moved to a new day of the week. And a new time. We are now broadcasting live on Sunday night, 8:00 p.m. cst. (AwakenedRadio.net or the TuneIn app). 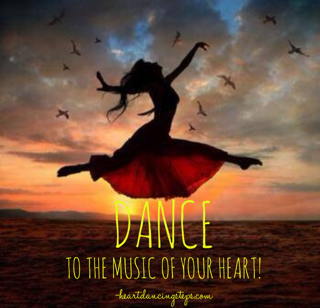 Tonight, I will share the third episode in the Heart Dancing Steps series. To remember how to live from your heart, not your head, there are certain concepts and steps to integrate into your life. Tonight, I will share the lyrics and the dance steps of Heart Dancing. Please share your name and email address so you can be the first to know about my new program. Can’t wait for you to join me in the dance! Have you ever been in a crummy mood and it changed instantly when you heard a great song? Music speaks to your heart without words getting in the way. Bonus: I created a Heart Dancing Playlist! These are songs that speak to me, make me want to dance or that lift up my mood when I am having a bad moment. What songs would you add that speak to your heart? Please let me know in the comments below. What Can a Grasshopper Teach You About Life?